Mace will start work shortly on a £120m office scheme for developer Helical above Farringdon Crossrail Station. PLP Architecture is acting as lead consultant on the East Ticket Hall new station development and has unveiled new images of the office building above the station. 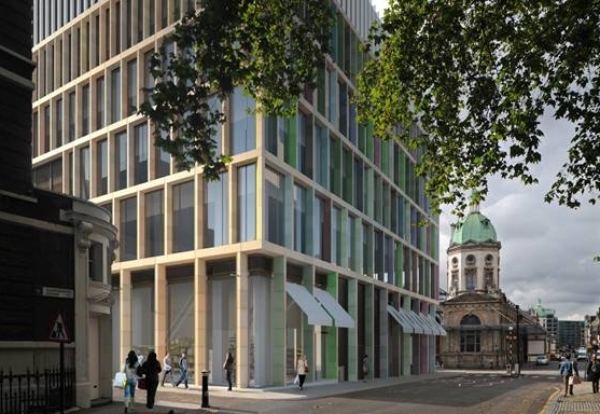 The six-storey scheme will sit above the station’s eastern ticket hall on Lindsey Street and offer 15,572sqm of office space, with retail units on the ground floor. The site is bounded by the Smithfield Conservation Area to the west and the Charterhouse Square Conservation Area to the east and to the north. Matthew Bonning-Snook, Property Director at Helical said: “We are a great believer in the potential of the area given the significant impact of Crossrail and due to the wealth of cultural and public realm improvements that are planned and underway locally. Construction completion is expected by October 2019.